An American model, actress and a fashion designer, Kidada Jones, who is well known for her work as a designer for The Walt Disney Company, where she has a line recognized as "Kidada for Disney Couture". Additionally, she famous as a former fiancee of late rapper Tupac Shakur, who died in 1996. Born as Kidada Ann Jones was born on March 22, 1974, in Los Angeles, California, United States. She is the daughter of famous personalities: music producer and Grammy Legend, Quincy Jones and the iconic actress, Peggy Lipton. Kidada Jones has one sibling named Quincy Jones II, from her father’s previous marriage to the Swedish model, Ulla Anderson. She along with her sister Rashida, both followed in their mother’s footsteps and became actresses. 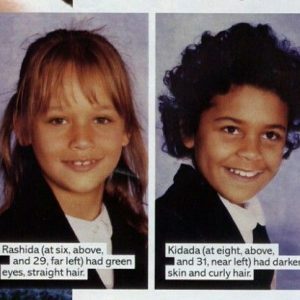 Kidada and her sister Rashida grew up in Bel-Air and lived a life of luxury. They went to school with socialites like Paris Hilton, Nicole Richie, and Kim Kardashian. After her parent's divorce, she stayed with her father while Rashida lived with their mother. Kidada Jones began her career working as a stylist for her father’s publication, Vibe and earned recognition for styling Michael Jackson on the cover of the magazine in 1995. At the age of 19, Kidada was serving for Tommy Hilfiger while attending the Los Angeles Fashion Institute of Design and Merchandising. Kidada Jones was Tommy Hilfiger’s muse for eight years before she worked for Snoop Dogg’s clothing line. She is a longtime designer of Disney Couture for the Walt Disney Company. While her designing career was on the lift, Kidada Jones did some more modeling for Hilfiger and appeared in Elle, Vogue, and Harper’s Bazaar. Hilfiger drafted Jones, Aaliyah, Kate Hudson, and Nicole Richie for a groundbreaking ad campaign. While modeling for Hilfiger, Aaliyah and Jones bonded. Aaliyah was R&B’s rising star gone too soon. She passed away in a tragic plane crash at the age of 22. After her death, Kidada was devastated and often spoke about Aaliyah in interviews. As an actress, Kidada has acted in movies such as Black and White, Thicker than Water, Intern, and Empire (the movie, not the awesome TV drama). Kidada Jones was famous as the fiancee of late rapper Tupac Shakur. The two had their first encounter in a club where he apologized for his word. In fact, before their relationship, Tupac said some offensive words about Jones' father Quincy Jones, a musical icon. After meeting in a club, the two began to date each other and got engaged in 1995. But after four-month of their engagement, Tupac was murdered in 1996 Las Vegas before they could get married. Many reports claim that she was one of the last people he had spoken to before he died in the hospital six days after he was shot. To this day, Kidada’s left arm still bears the tattoo of the deceased rapper but now she has replaced the tattoo with a flower. After Tupac’s death, Kidada briefly dated to Leonardo DiCaprio in 1999. Then, Kidada Jones began to date rapper and actor, LL Cool J. in 2001. The couple seemed to be close to each other and they were spotted together in different places and social sites but their relationship ended in 2003. Kidada Jones married to actor Jeffrey Nash in 2003 in front of hundred of guests. However, their relationship did not work out and divorced in 2006, but remain friends. Currently, there’s no information on whether Kidada Jones is in a relationship. The 5' 7" actress Jones is a well-known designer for The Walt Disney Company. She has also a line known as Kidada for Disney Couture. As a model and actress, she has modeled several brands and acted several films. Her estimated net worth has $3 million. To known more about her follow her social networking sites like Facebook, Twitter, and Instagram.